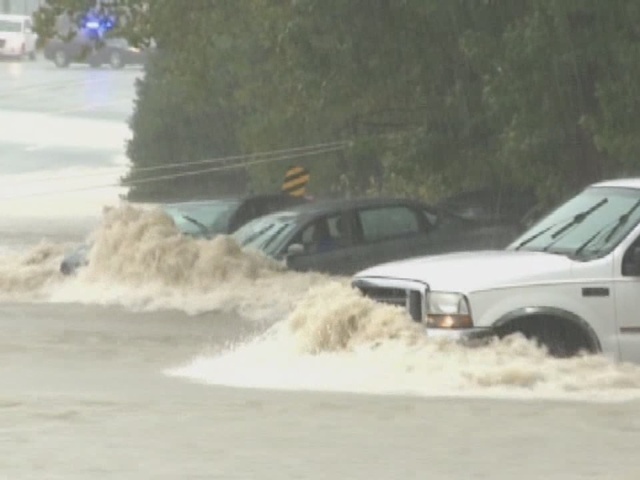 Days of torrential rains kept much of South Carolina and its capital gripped by floodwaters early Monday as emergency responders promised renewed door-to-door searches for anyone still trapped after a weekend deluge and hundreds of rescues. Heavy rain kept falling into the early hours Monday around the Carolinas from the storm that began swamping the Southeast late last week, part of an unprecedented low pressure system that dumped more than 18 inches on one spot alone in Columbia, the South Carolina capital. The rainstorm dumped so much water on South Carolina and parts of several surrounding states that even the weather experts said they were astonished. One of the hardest hit areas in Columbia was near Gills Creek, where a weather station recorded more than 18 inches of rain — or more than a third of the city's average yearly rainfall — nearly all of it in 24 hours. The creek was 10 feet above flood stage, spilling floodwaters that almost reached the stoplights at a four-lane intersection. Contributing to this report were Associated Press writers Bruce Smith in Charleston, South Carolina; Mitch Weiss in Greenville, South Carolina; Jonathan Drew in Durham, North Carolina; and Susanne Schafer in Columbia.